This example shows an Article Window. Each article contains one “note” of information that you want to remember. 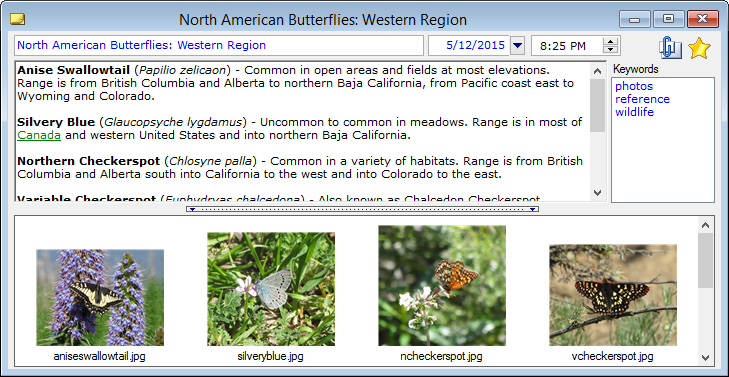 Use the Article Windows to enter, modify, and index your notes. Any number of articles can be open at once. The image thumbnails along the bottom of the Article Window preview any image files which are attachments to this article. The star icon indicates that this article is bookmarked. The green, underlined text in the article is a hypertext link to another article, a file, or a web site.